VLAARDINGEN – A punitive expedition against Dirk III of Holland ended in failure. The Imperial Army, led by Duke Godfrey of Lorraine, was defeated in Vlaardingen and captured the Duke. Miscommunication became part of the imperial army panicked and hit the fleeing. The remaining troops were no match for the supporters. Whether a second punitive expedition comes to Vlaardingen is unclear. The problems are caused by Dirk III turned against his Emperor. From his stronghold in Vlaardingen, the Merwede, late Count Dirk moor ships and forces traders to pay toll. The Count has the emperor never had the right to levy tolls. The trade guild in Tiel has complained about the emperor of the German Empire, During the Reichstag in Nijmegen, a few months ago. Traders were able to convince the emperor that he is missing out on tax revenues through illegal toll in Vlaardingen. They received approval from Bishop Adelbold Utrecht, whose lands along the Merwede by Dirk III welcomed. That Emperor Henry II himself was persuaded to intervene is remarkable. Count Dirk III was his cousin (the mother of Dirk III is the sister of Empress Cunigunde), but the political interests (Adelbold is an important ally) and financial interests outweigh family ties. Dirk III made an attempt to defend its positions in Nijmegen, but could not persuade the emperor. The count was ordered to stop to return illegal toll and the conquered countries Adelbold, but he refused. Then Dirk III Nijmegen left. Emperor Henry gave military commander Godfrey of Lower Lorraine instructed to call Dirk III to order. In the past three years, the Duke he twice before a rebellious count reports. Godfrey was delivered troops from the dioceses Liege, Kamerik, Cologne and Utrecht. His force consisted of about a thousand men. The bishops of Utrecht and Adelbold Balderik Liege went along. The men are brought to Vlaardingen with dozens of ships. Thus the force with respect to the pair was a hundred (poorly-trained) men of Dirk III overwhelming. The capture of Duke Godfrey, During the re-entry of the Battle of Vlaardingen on 14/15 juni 2008 Vlaardingen. Foto: Rene Kuysten. En route to Vlaardingen fate hit soon to the imperial troops. Balderik bishop of Liege was unwell and had to disembark. He died a short time later. Without the bishop ships arrived this morning at Vlaardingen. Count Dirk had the ships seen coming and had retreated to his castle. The environment of Vlaardingen is particularly water-saturated, and is intersected by locks and creeks. Godfrey showed why his troops to march flat, so they would have room to move. During the march, the vanguard was suddenly attacked by the Vlaardingers who had laid an ambush in the bog. In the rear, where they could not see what was happening, got some soldiers in panic. It was established that Godfrey was slain or fled. This miscommunication caused mayhem in the imperial army. The soldiers in the rear tried to come back as soon as possible to their ships, but with their heavy armor they got stuck in the muddy riverbank. Bishop also Adelbold Utrecht hit on the run. He would have arrived during the day 'excited but unhurt' in Utrecht. Godfrey of Lorraine remained a depleted army behind on the battlefield, while Dirk III Vlaardingers sent behind the escapees to. The imperial army killed many soldiers, while among the men of Dirk III are hardly victims. The bodies of the victims were thrown into the river Merwede. Eyewitnesses Dirk III himself was still on the battlefield, when Godfrey was almost completely defeated. Dirk has captured the Duke. There would have been negotiated his release. Neither party has as yet announcements about done. Dirk III will likely demand that he temporarily dropped by Emperor Henry alone. It Dirk III is also very strong, because he is responsible for coastal defense against the Vikings. Godfrey was soon set free again. He made sure there was peace between Dirk III and Adalbold. Without Dirk III, the area was no longer defended and the Vikings had free rein, as was thought. What arrangements are made and forth between Adalbold and Dirk III is not clear. In the first thirty years after the Battle of Vlaardingen was quiet in the area. There are then still made several attempts to get the counts of Holland in the area, but that did not work out. Some stories and names may seem to come across strange, but knocking weldegelijk. This is mainly because the names of those days were slightly different from today. West-Frisia: The area that we now call 'Holland'. It is best compared with North- and South Holland and Zeeland. Dirk III was the excavation of the area. 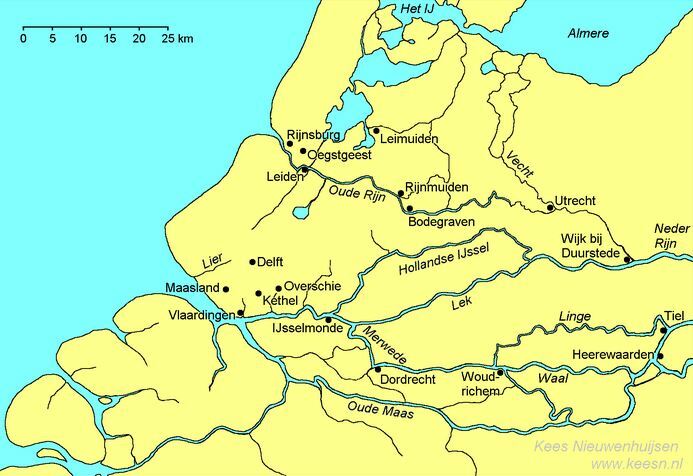 Frisia: The area where the Frisians lived. Holland, Zeeland, Utrecht, Friesland, Groningen and part of Germany. West Frisia is part of this. Lower Lorraine: Largely Benelux and the Ruhr area. Count of Holland: Holland was hardly used term. It lasted till 1101 before this title was used. Dirk III of Holland so was Count of Western Frisia. Merwede: While today Vlaardingen is located on the Meuse, lay it 1018 the Merwede. The river had then another loop. Kees Nieuwenhuijsen, Battle for Western Frisia, Omniboek, Utrecht, 2016. Westfrisia about 1018. In Henderikx (1997, p. 104) and Mostert (2002, p. 152).